The Filer Research Institute feels the scientific study of UFOs is for the benefit of humankind and is an important endeavor. The weekly intelligence report provides you with information on the latest sightings and UFO news that you need to understand the world situation. In special reports, this week’s files cover: Minister of Defence Hellyer Claims We Shot Down UFOs, Space Storm Warning, Executive Directive to Sci/Tech Task Force “Prepare for Shifting Climate, MacArthur’s Quotes Were a Summation of his Statements, Indian Temple Vault B Not Opened, and Fastest Sermon Ever!!! Unidentified Aerial Phenomena sightings were reported over: Arkansas, California, Florida, Maine, Mississippi, Nevada, New Hampshire, New Jersey, New York, Ohio, South Carolina, Texas and Washington. Sightings of UFOs were also reported in: Argentina, Australia, Canada, Italy, Mexico, New Zealand, Puerto Rico, Spain, and England in the United Kingdom. The purpose of these files is to report the UFO eyewitness and photo/video evidence that occurs on a daily basis around the world and in space. I believe the God of the universe has spread life throughout the cosmos and UFO’s are visiting us in ever-increasing numbers. The honorable Paul Hellyer, Canada’s former Minister of Defense appeared on the Russian TV with Sophie Shevardnadze to discuss extraterrestrials and UFOs. We have a long history of UFOs and of course there has been a lot more activity in the last few decades since we invented the atomic bomb,’ he said. As far as technology is concerned, they are light years ahead of us, and we have learned a lot of things from them. A lot of the things we use today we got from them, you know – led lights and microchips and Kevlar vests and all sorts things that we got from their technology and we could get a lot more too, especially in the fields of medicine and agriculture if we would go about it peacefully. But, I think, maybe some of our people are more interested in getting the military technology, and I think that’s wrong-headed, and that’s one of the things that we are going to have to change, because we’re going to have to work together, all of us, everywhere on the planet. ‘Our future as a species, and here I mean all of the species in the world, is potentially at risk if we don’t figure what’s going on and work together to try and make life more amenable for all of us, and to work with our neighbors from other planets as well.’ Aliens are also responsible for some of our modern technology including the microchip, LED light and Kevlar vest, he said. Hellyer said there has been a lot more activity with aliens in the last few decades since we invented the atomic bomb. One of the technological advances that humans have aliens to thank for are Kevlar vests. Hellyer described one group as ‘Short Greys’ who have very slim arms and legs and are about five feet high with large heads. While Hellyer said he has never met an alien, but has seen a UFO near his cabin on Ontario’s Lake Muskoka. Hellyer described several types of aliens including ‘Tall Whites’ who are working with the U.S. air force in Nevada. ‘They’re able to get away with that; they had a couple of their ladies dressed as nuns go into Las Vegas to shop and they weren’t detected,’ he claimed. The “Los Angeles Times” confirms that a storm warning was issued earlier this week for a space storm, that one such storm already struck the earth this week, but a larger one is expected. Storm warning has been issued for space, where a “cannibal” coronal mass ejection grabbed the attention of space-weather watchers. The sun — at a peak of activity in the 11-year solar cycle — hurled a pair of CMEs that reached Earth early Saturday morning. The ejections, as NASA’s Alex Young says, “are a huge release of solar material, billions of tons, and magnetic field.” Upon reaching Earth, they can wreak havoc with our power grid — and, on the bright side, create gorgeous auroras. The forecast from NOAA’s Space Weather Prediction Center is for a moderate geomagnetic storm. A geomagnetic storm is a temporary disturbance of the Earth’s magnetosphere caused by a solar wind shock wave and/or cloud of magnetic field which interacts with the Earth’s magnetic field. There are two more sunspot groups which are also rotating along the Sun’s central meridian. Sunspots 1977 and 1976 present delta-eta configuration indicating the potential for X-class and M-class flares. Events from these groups will also be Earth directed for the next 72+ hours. Over the weekend thirteen M-class flares were released from one sunspot during 48 hours and more are expected. Sunspot 1974 is large and is situated along the central meridian of the Sun, as a result solar events will be Earth directed. There are two more sunspot groups which are also rotating along the Sun’s central meridian. Sunspots 1977 and 1976 present delta-eta configuration indicating the potential for X-class and M-class flares. Events from these groups could flare up in the future. STORM WARNING, CANCELED: A brief geomagnetic storm on Feb. 15th sparked by a CME impact has petered out. The CME appears to have been a merger of three minor clouds that, even together, could not cause a sustained disturbance in Earth’s magnetic field. After days of nonstop activity, big sunspot AR1974 is quieting reducing the chance for an X-class flare. RADIOACTIVE’ ERUPTION: On Feb. 17th at 04:50 UT, a magnetic filament erupted from the sun’s western limb. NASA’s Solar Dynamics Observatory captured this high-resolution image of the blast. Because of its location on the sun’s western limb, the eruption did not send a CME toward Earth. However, there was an effect on our planet: Shortwave radio loudspeakers roared with static, an event called a Type II radio burst. Unlike Earth and other solid objects, the entire Sun doesn’t rotate at the same rate. Because the Sun is not solid, but is instead a giant ball of gas and plasma, different parts of the Sun spin at different rates. We can tell how quickly the surface of the Sun is rotating by observing the motion of structures, such as sunspots, on the Sun’s visible surface. The regions of the Sun near its equator rotate once every 25 days. The Sun’s rotation rate decreases with increasing latitude, so that its rotation rate is slowest near its poles. At its poles the Sun rotates once every 36 days! The sun’s intense solar activity usually occurs away from aiming at Earth, but some day a powerful electromagnetic flare could cause havoc on Earth. Worse yet, the next period of intense solar activity is expected, and coincides with the presence of an unusually large hole in Earth’s geomagnetic shield. Israel Curiel, Public Relations Director, Mutual UFO Network NC writes, “Let me first say that I really enjoy reading your emails every week. I had read about the quote from McArthur and wanted to find a link online so that I could share it on MUFON-NC.com. Unfortunately I found that McArthur never said, ‘”The nations of the world will have to unite for the next war will be an interplanetary war. The nations of Earth must someday make a common front against attack by people from other planets”’ You can read the full explanation here:” at http://www.snopes.com/quotes/macarthur.asp. Snopes.com writes: This item is a difficult one to classify: It’s literally false as worded, because the person named didn’t speak the specific words attributed to him. However, by combining things the same person said at different times and places, one could come up with a reasonable approximation of the original statement. The quote attributed to a 1955 West Point address by General of the Army Douglas MacArthur, about the next war being an interplanetary one, is cited in a variety of works and web sites related to UFOs and extraterrestrials and still surfaces in newspapers and other publications. However, MacArthur did not deliver a speech at West Point that year, nor is there any record of his specifically stating an opinion that the “next war” would be an “interplanetary” one. The confusion starts with comments reportedly made by MacArthur when he was paid a private visit at his residence in New York’s Waldorf-Astoria Hotel by the Mayor of Naples, Achille Lauro, in October 1955. Mayor Lauro relayed the gist of their 45-minute conversation to the press, maintaining MacArthur had expressed a belief that someday the people of Earth might find themselves facing an extraterrestrial confrontation. The politics of the future will be cosmic, or interplanetary, in General MacArthur’s opinion, the Mayor continued. He quoted the military leader as saying that a thousand years from now today’s civilization would appear as obsolete as the Stone Age. Richard Anderson writes, “It matters not what your religion is…you will get a big smile watching this One Minute and 39 seconds sermon. WASILLA — My mother and I were returning home and I was in the passenger seat of the car on February 5, 2014. I looked up and saw a large glowing red object in the clear sky. It was apparent that it was not a star due to the size and brightness. The object was stationary and slowly changed color from red to a lava-like red-orange and back to red again twice before my mother stopped the car and I took a photo. Once I got out it seemed that the lights from the car down the street made it harder for me to get a decent shot without glare, but I tried anyway. I snapped a few photos and then it dimmed and disappeared, as if it was traveling very fast straight backwards. SACRAMENTO – On February 10, 2014, I was parking my car when I thought I had seen an orange meteor. It then separated into three red lights dancing around each other flying quickly through the skies. The lights zigzagged and then disappeared. I managed to record a few seconds.. I also came across an individual who also saw it and captured an amazing light show. Note: I personally took this picture of the sunset at Key West, but didn’t see the red lights. Although my wife and her sister saw two high flying cylinders leaving short white trails. LAS VEGAS – The witness took pictures from Excalibur Hotel with his cell phone on a negative setting and captured a disc shaped UFO as well as a helicopter. Being a helicopter buff he was shooting at one while hearing its engines. He decided to take a photo of the helicopter in a negative setting on his cell phone. A second photo was taken three seconds later with regular settings, but was a little too late to catch the chopper or the UFO. SYRACUSE UNIVERSITY’S HOLDEN OBSERVATORY — On the winter’s night of February 20, 1947, five months before the famous Roswell UFO incident, two classmates of Syracuse University along with an astronomer reportedly witnessed strange elliptical or circular objects crossing across the horizon, covering the stars as they passed at tremendous speed. The two classmates were walking around 10:15 PM on the school campus and noticing that the dome doors of Holden Observatory were open so they entered. They noticed a 7-foot long refracting telescope that being used by a man who walked it back and forth rapidly in the length of the dome opening. When the astronomer noticed the two students as they climbed the platform, he was thanking God that the two were there. The astronomer told the two students that he had been witnessing something unusual in the night sky. He then let the students take a look what he’d been watching without giving them a clue. He was in awe of the bright star field and then noticed a light passed his view in the dark sky. He then observed more after 20 or 30 seconds. He counted twelve mysterious lights. After being puzzled of what he had seen, he then gave the telescope to his pal. After a few minutes, his pal looked as puzzled as him and the astronomer. The three men agreed that they had seen the same objects. The three men were able to witness the details of these objects through the telescope. They all witnessed the same objects that appeared to have a grayish bottom, slightly lighter than the dark sky background. The objects had thin bright yellow orange trailing edge which appeared slightly rippling. All men noted that some of the objects appeared to be brighter than others. The astronomer assured the students that he had never seen anything like the mysterious objects. After a couple of minutes, the students bid the astronomer a good night. That was the first and only time they met the astronomer. WASHINGTON HEIGHTS – Video of bright light in the sky taken February 15 2014 at 12:30 AM, by Juan Nunez. Light appears to gradually lower in altitude in shaky video. SPOKANE — On February 5, 2014, I was awoken to a loud sound like the after burners of a rocket. The noise was coming from above and shook our house. I am very familiar with the noises planes make when they travel over our home because I grew up around airplanes as my dad was a pilot. The noise startled me because I never ever had heard anything like that before in our area. I got up looked out our large 2nd floor bay window to see an object that was changing colors as it floated west. My husband and son also witnessed the beautiful emerald green object, that changed to red, blue, orange and white. We were so surprised to see a UFO right in front us as it traveled slowly west towards Seattle. SYDNEY, NEW SOUTH WALES — I was in Taylor Square and noticed an object approaching from above Garden Island Naval Base on February 9th 2014, at 9:39 PM. It was a three cornered gunmetal grey triangular object with a red projection on top at one end. It rotated in an anticlockwise direction. WHITBY – My family and I went to Whitby 28 October 2007 for the Goth Weekend. I had a new Olympus E330 with which I took three photos on the top of Whitby Cliffs (next to the Abbey) to stitch together for a panorama. Christmas week that year I opened the photo on my PC full size and was astonished to see two cylinder shaped UFOs just below the clouds. There have never been any similar entities on photos and I know that they are not any form of lens flare. When you zoom in on the Photo you can see that the cylinders are lighter on top and darker underneath. Frankly, I need your help to put out these weekly wrap ups of the weeks most important sightings. I spend about 50 hours a week preparing the files. Only a few people who have enjoyed the files for years have chosen to provide a donation. I would greatly appreciate your contributions to help sustain my production, reporting and research efforts. I want to thank the people who have sent donations to Filer’s Files for this year. When you send in a subscription, please include your latest E-mail address. Do not miss the latest images of UFOs from Earth and Mars. What are they doing to humans and animals? PayPal and/or Credit Card Donations Use this link. Our research is uncovering amazing truths by solving challenging projects deemed too difficult by other firms. We have had some success in finding missing persons. We could use your help in getting more results from our research. 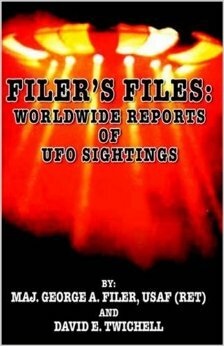 I have put together a DVD of the last seventeen years of Filer’s Files for you with hundreds of great photographs and UFO sightings. Additionally, I have decided to include my book within the DVD that includes George Ritter’s exciting abduction story told by Linda Moulton Howe. Broadcaster David E. Twichell joined me to write the book. We are asking for a donation of only $50 that includes next year’s subscription and our book. Please include your e-mail address and mailing address. Have been digging through the giant DVD you sent recently. As a relatively recent joiner, I was unaware of the years’ worth of consistent reports of the same types of objects all over. This has been very educational. Just wanted to thank you for all you’ve done. Sign me up right now for Filer’s Files. I am offering seventeen years of Filer’s Files on a DVD with thousands of photographs and sightings for a donation of $50 that includes this year’s subscription. Please use this link to receive this offer. Filer’s Files salutes our fighting men and women; God Bless Our Troops, and Georgie, Elizabeth, and Victoria Filer, and Eddie Pedrick. May the Angels be your guide and take you to paradise. Previous: Cruithne, Earths Second Moon?